It's OK to eat some romaine lettuce again, U.S. health officials said. Just check the label. The Food and Drug Administration narrowed its blanket warning from last week, when it said people shouldn't eat any type of romaine because of an E. coli outbreak. The agency said Monday that romaine recently harvested in Arizona, Florida, Mexico and California's Imperial Valley is OK to eat. It says romaine from those places wasn't yet shipping when the illnesses began. It says the tainted romaine appears to have come from the Central Coast region of California. The produce industry agreed to start putting harvest dates and regions on labels. For romaine that doesn't come in packaging, grocers and retailers are being asked to post the information by the register. 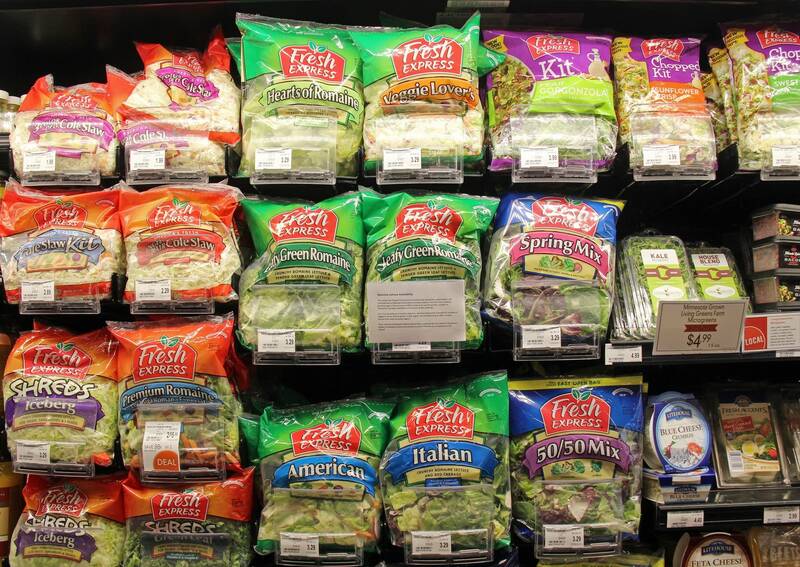 The FDA warned Americans not to eat romaine that isn't labeled with that information, and it said it had commitments from the industry that such labeling will become standard for romaine. It also noted hydroponically grown romaine and romaine grown in greenhouses isn't implicated in the outbreak. The labeling arrangement was worked out as the produce industry called on the FDA to quickly narrow the scope of its warning so it wouldn't have to waste freshly harvested romaine. An industry group said people can expect to start seeing labels as early as this week. It noted the labels are voluntary, and that it will monitor whether to expand the measure to other leafy greens and produce. Robert Whitaker, chief science officer of the Produce Marketing Association, said labeling for romaine could help limit the scope of future alerts and rebuild public trust after other outbreaks. "Romaine as a category has had a year that's been unfortunate," Whitaker said. The FDA still hasn't identified a source of contamination in the latest outbreak. There have been no reported deaths, but health officials say 43 people in 12 states have been sickened. Twenty-two people in Canada were also sickened. Even though romaine from the Yuma, Arizona, region is not implicated in the current outbreak, it was blamed for an E. coli outbreak this spring that sickened more than 200 people and killed five. Contaminated irrigation water near a cattle lot was later identified as the likely source. Leafy greens were also blamed for an E. coli outbreak last year. U.S. investigators never specified which salad green might be to blame for those illnesses, which happened around the same time of year as the current outbreak. But officials in Canada identified romaine as a common source of illnesses there. The produce industry is aware the problem is recurring, said Jennifer McEntire of the United Fresh Produce Association. "To have something repeat in this way, there simply must be some environmental source that persisted," she said. "The question now is, can we find it?" Growers and handlers in the region tightened food safety measures after the outbreak this spring, the industry says. Steps include expanding buffer zones between cattle lots and produce fields. But McEntire said it's not known for sure how the romaine became contaminated in the Yuma outbreak. Another possibility, she said, is that winds blew dust from the cattle lot onto produce. McEntire said the industry is considering multiple theories, including whether there is something about romaine that makes it more susceptible to contamination. Compared with iceberg lettuce, she noted its leaves are more open, thus exposing more surface area. Romaine harvesting just recently began shifting from the Central Coast growing regions in central and northern California to other regions. Since romaine has a shelf life of about 21 days, health officials said last week they believed contaminated romaine could still be on the market or in people's homes. Food poisoning outbreaks from leafy greens are not unusual. But after a 2006 outbreak linked to spinach, the produce industry took steps it believed would limit large scale outbreaks, said Timothy Lytton, a Georgia State University law professor. The outbreak linked to romaine earlier this year cast doubt on how effective the measures have been, he said. But Lytton also noted the inherent risk of produce, which is grown in open fields and eaten raw. The FDA said the produce industry also agreed to consider longer-term labeling options that would help identify and trace leafy greens.